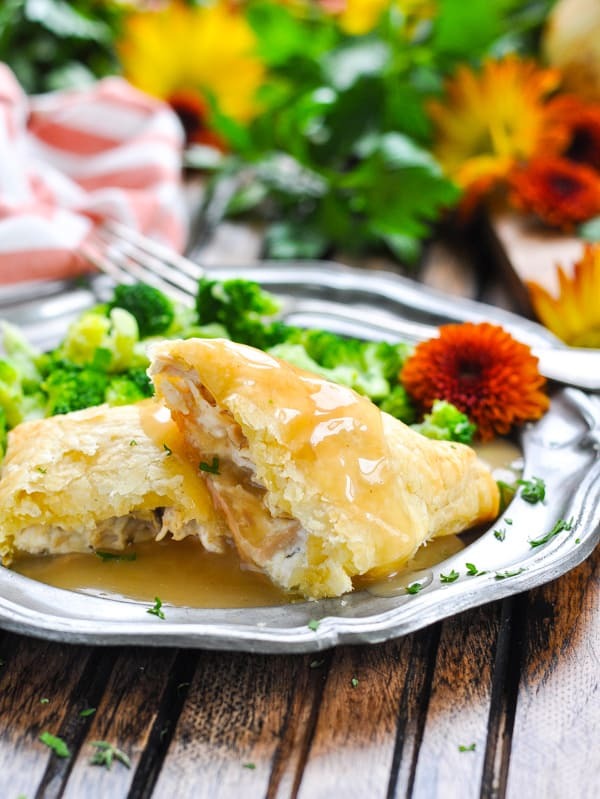 Made with leftover turkey and puff pastry, these Turkey Pot Pie Pockets are an easy dinner recipe that the whole family can enjoy! Freezer-friendly, too! The holidays often leave us with leftover turkey that we can enjoy in the weeks ahead. 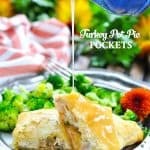 When you have some spare turkey (or even chicken) in your kitchen, these Turkey Pot Pie Pockets are a delicious, easy dinner recipe to add to the menu! My Aunt Carole originally gave me this twist on a Turkey Pot Pie recipe (handwritten on an old index card!!!) at my bridal shower over 14 years ago. Where does the time go?! I have obviously held onto this meal over the years because it’s that good! 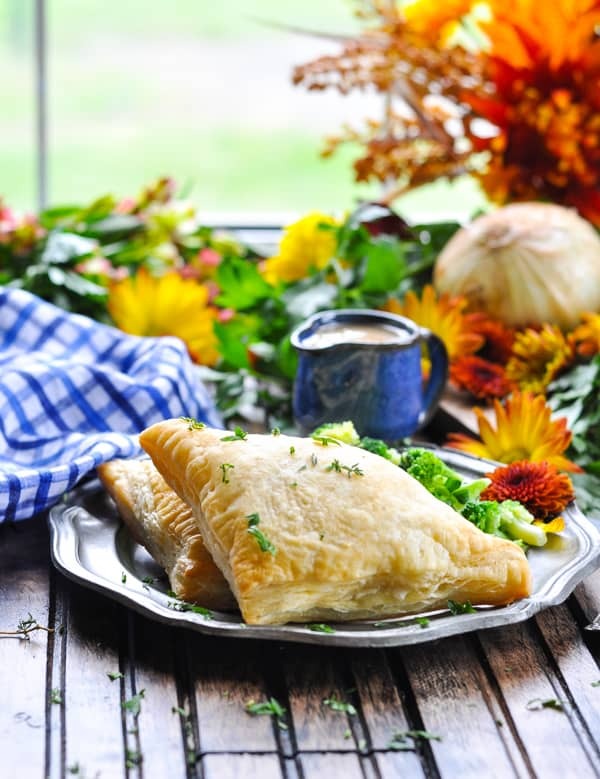 The Turkey Pot Pie Pockets are made with puff pastry, and they’re just a really simple way to repurpose your leftover turkey or chicken. The pockets are little hand pies that don’t even require utensils — especially if you’re a kid! 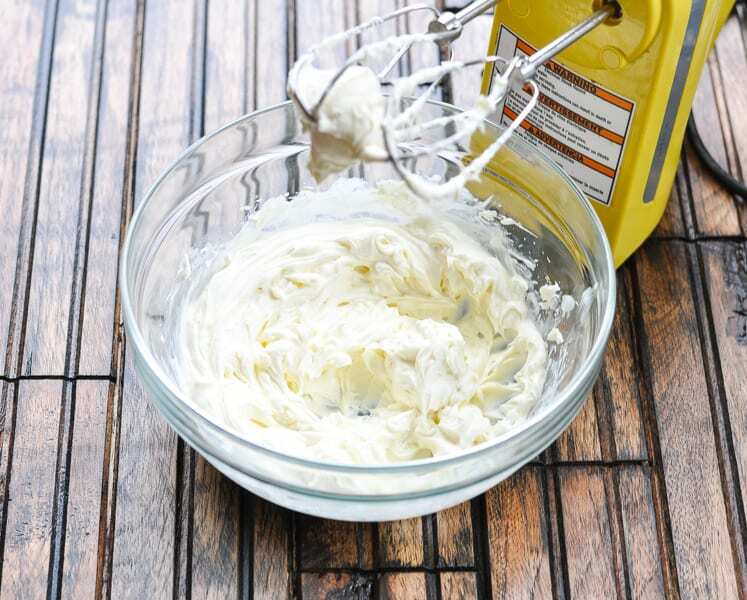 Use an electric mixer on low speed to quickly combine softened cream cheese, softened butter, onion, and milk. You can do this by hand, but the mixer makes it nice and fluffy…within about 30 seconds! Fold in the cooked turkey (or chicken), salt and pepper. 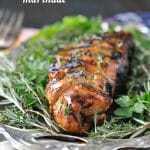 You could also stir in some fresh herbs such as thyme or chives, if you have them on hand. Next, it’s time for the puff pastry! Unfold one sheet of thawed puff pastry, and roll it out on a floured surface. You want to roll it into a larger 11-inch by 11-inch square. Cut that larger square into 4 smaller squares, and place some of the turkey filling in the center of each square. Dip your fingertip in a bowl of water and run your finger along the edge of each square. Moistening the pastry dough will help to seal the edges. Then fold the square (corner to corner) over the filling to form a triangle. 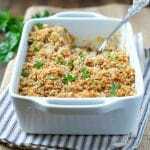 Lightly press a fork along the edges of each triangle to seal. 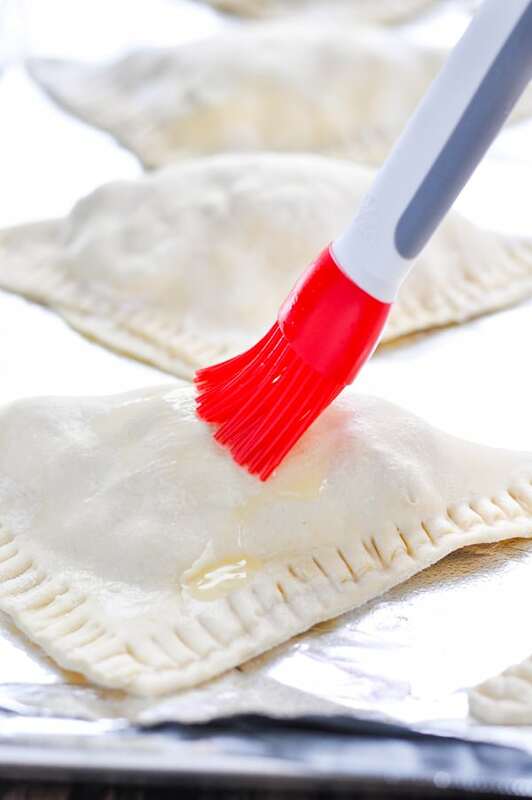 Place the pot pie pockets on a baking sheet and brush the tops with melted butter. This will help them to brown in the oven. Bake the Turkey Pot Pie Pockets at a temperature of 350 degrees for about 25-30 minutes, or until they’re golden and flakey. 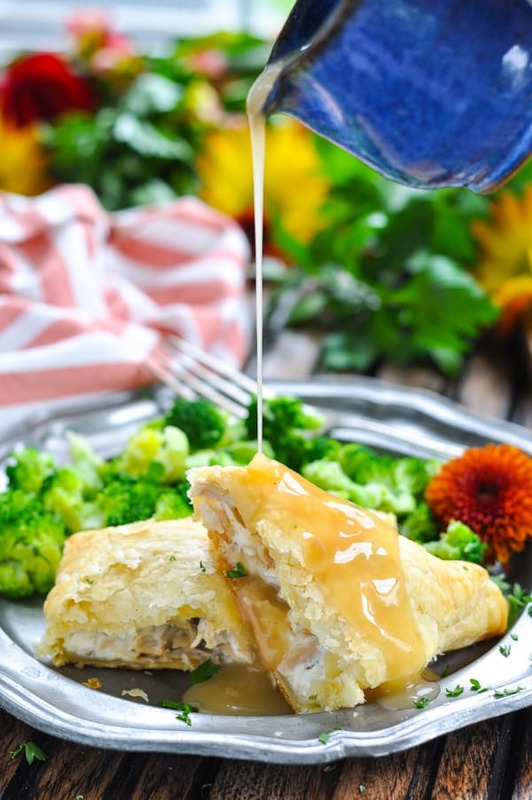 Can you freeze Turkey Pot Pie Pockets? Yes! To freeze, allow the pockets to cool to room temperature. Wrap tightly with plastic wrap and foil. Keep in the freezer for up to 3 months. 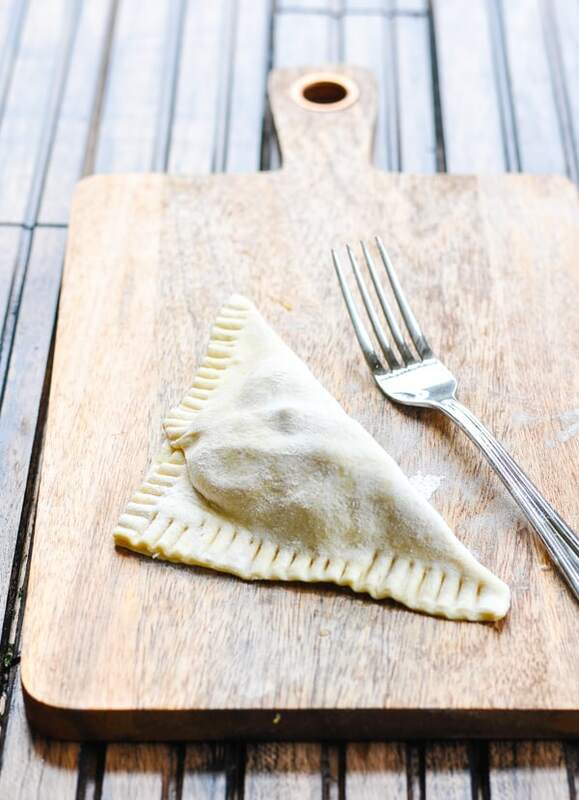 To reheat frozen pockets, place on a baking sheet, cover loosely with foil, and bake at 350 degrees F for about 20-30 minutes, or until heated through. Serve the pockets with gravy for dipping or pour over top, if desired! 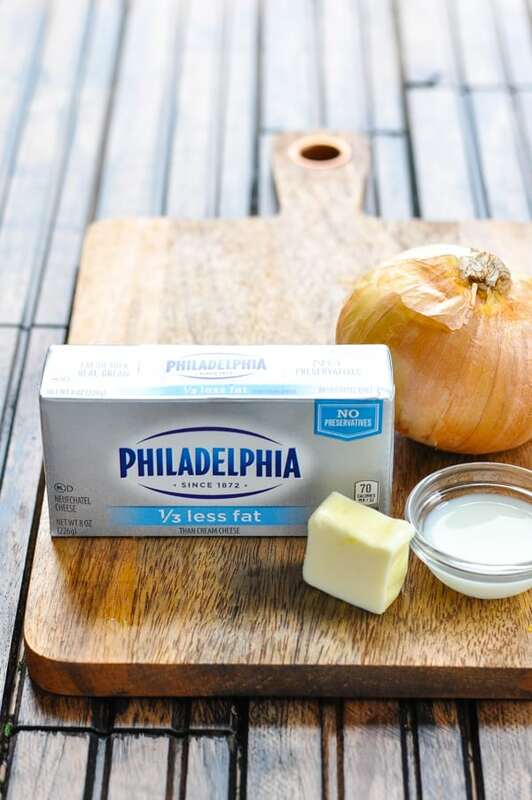 Try using Chive and Onion Cream Cheese instead of the plain cream cheese for an added boost of flavor. Feel free to include some herbs in the filling if you have them on hand. Minced thyme, rosemary, parsley, or chives would all work well. This recipe yields 7-8 pockets, depending on how much filling you put in each triangle. I like a larger amount of filling in each pocket (about 1/3 cup), so I get about 7 pockets out of the recipe. If you want to stretch the filling for 8 pockets, just use less turkey mixture in each pocket (about 1/4 cup per triangle). 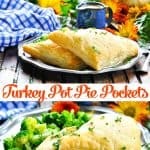 While the recipe yields 7-8 pocket, it’s safe to assume that most adults will likely want 2 pockets per meal. 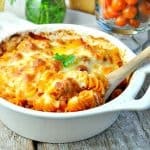 A child might be satisfied with one pocket, so plan accordingly if feeding a crowd! 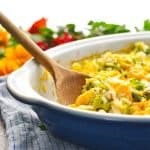 This recipe works equally well with chicken! Use leftover roasted chicken, or purchase a rotisserie chicken from the store for a shortcut! Make sure that your cream cheese and butter is at room temperature before mixing. 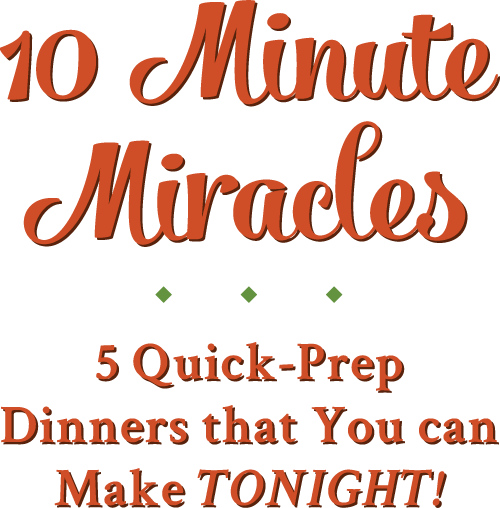 This will help the ingredients blend easily and it will give you that smooth, fluffy texture! Make sure that your puff pastry is at room temperature (thawed) before you try to roll it out. You will find a specific thawing instructions for your product on the box, so check your package for details. 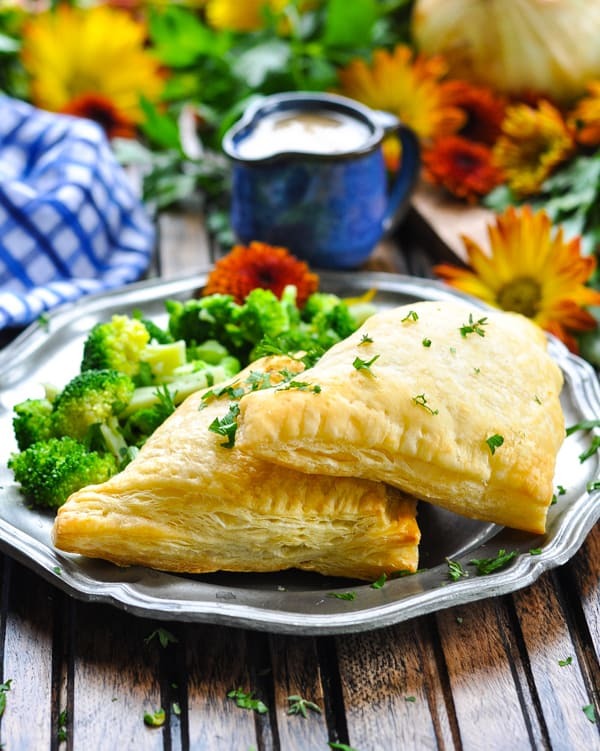 Serve the turkey pot pie pockets with a fresh green salad, with some steamed or oven roasted broccoli, with a pan of roasted acorn squash, or with your other holiday leftovers! Preheat oven to 350 degrees F. Line an extra large baking sheet (or two smaller baking sheets) with foil and lightly mist with cooking spray. Set aside. 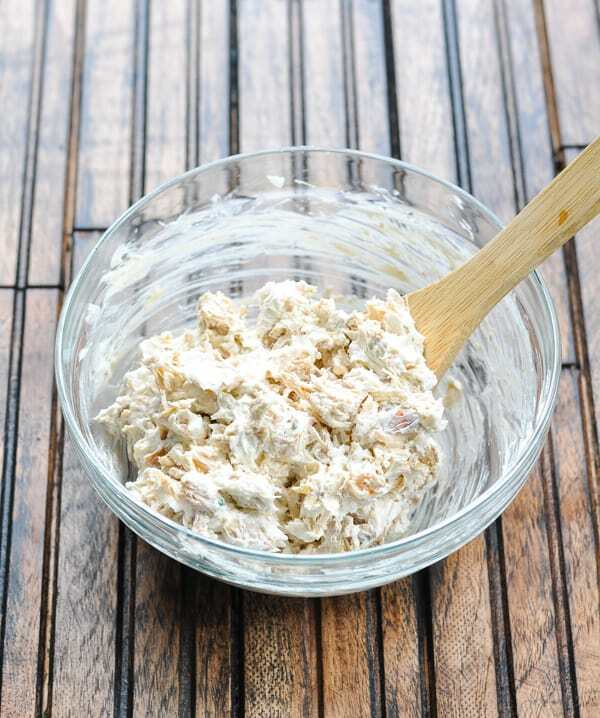 Use an electric mixer on low speed to blend cream cheese, softened butter, milk, and onion until smooth. Fold in turkey, salt, and pepper. Unroll one sheet of puff pastry on a floured surface. 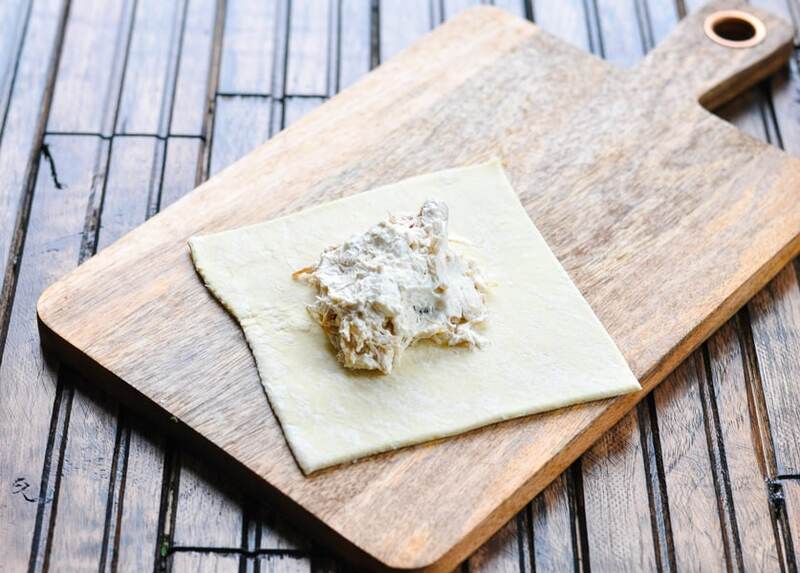 Use a rolling pin to roll the puff pastry into a larger square (measuring about 11 inches x 11 inches). 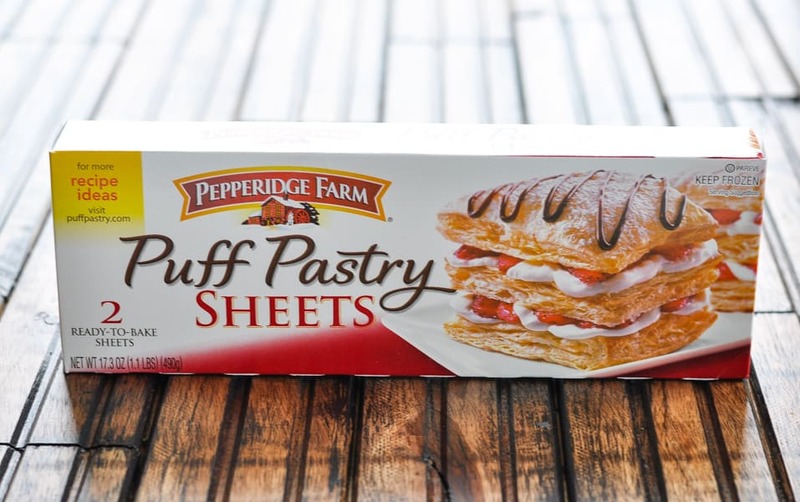 Cut the large sheet of puff pastry into 4 squares. Add about 1/4 cup - 1/3 cup of turkey mixture onto center of each square. Dip fingertip in small bowl of water and run finger along edge of each square. This will help to seal the triangles. Fold square (corner to corner) in half over turkey mixture to form a triangle. Lightly press a fork along the edges of each square to seal. Place turkey pot pie pockets on the prepared baking sheet. Repeat with remaining sheet of puff pastry and remaining turkey filling. Brush tops of triangles with melted butter. 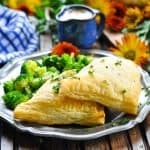 Bake Turkey Pot Pie Pockets for 25-30 minutes, or until lightly browned. Serve with gravy, if desired. While the recipe yields 7-8 pocket, it's safe to assume that most adults will likely want 2 pockets per meal. A child might be satisfied with one pocket, so plan accordingly if feeding a crowd! To freeze, allow the pockets to cool to room temperature. Wrap tightly with plastic wrap and foil. Keep in the freezer for up to 3 months. 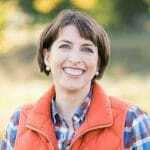 This post was originally published in November, 2012. It was updated in September, 2018.